But fear not! 7hofm is giving you and a friend the chance to Break-A-Way with Buble! You could win flights, accommodation, and of course tickets to see the Bube at his ONLY Aussie show, October 5 at Sydney's Alianz Stadium. Just listen to Breakfast with Sarah, Mick & Matt next week for your chance to play! 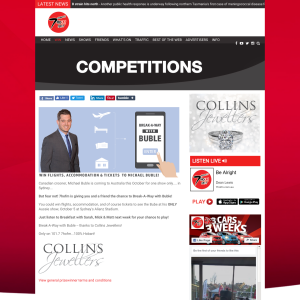 Break-A-Way with Buble -- thanks to Collins Jewellers! Only on 101.7 7hofm...100% Hobart!